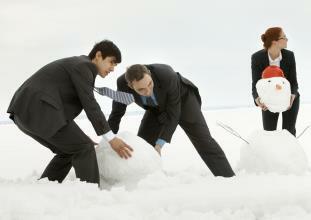 With talk of snow again this week we look at how snow chaos can affect businesses. For workers who work inside, the general rule is that the temperature in workplaces should be at least 16 degrees Celsius. However, there is no legal minimum outdoor working temperature so employers need to rely on risk assessments. Employers do have to comply with Health and Safety requirements so should provide protective clothing and follow the HSE guidance. Employees are obliged to attend the office unless they are sick, on holiday or on family friendly leave etc. Therefore, if the office is open and employees cannot make it into work because they are 'snowed in', you are entitled to treat their absence as unauthorised and are under no obligation to pay them. In practice though very few contracts of employment state that employees who cannot get into work because of the weather will lose a day's pay. Taking such a stance may also have a negative impact on morale and productivity. Additionally, if an employee's normal mode of transport is out of action due to severe weather disruption they should not feel pressured to risk their safety to get into the office so it may be sensible to consider other options. where possible the employee could work from home until the weather situation has improved. To avoid the office becoming a temporary playgroup, there are rules that allow parents to take time off when there is an 'unexpected disruption to childcare' such as school closures. Strictly, the day would be unpaid but not all employers will take this approach. If you believe that an employee is using the weather conditions as an excuse for absence this could be a disciplinary matter. However, it is doubtful that most employers would want to devote time and resources to investigating the circumstances of each individual worker who is suspected of taking a 'snowball' day. Alternatively, you could let employees know by phone, email or text that any time off will need to be taken as holiday. You may find that once this has been communicated, employees suddenly start finding ways to get in. If you decide to temporarily close your business premises at short notice because of unforeseen circumstances, such as heavy snowfall, and there is no work available for your employees as a result, you cannot withhold pay. The only exception to this is if you have a specific clause in your contracts of employment and you should only withhold pay after taking legal advice. Employers should consider introducing an 'adverse weather and a ‘homeworking policy’ so employees know what you expect of them when severe weather strikes. This will also help avoid confusion and conflict when the snowfall arrives. For further information or advice please contact any of the team.